A beautiful villa divided into five large apartments, each with its own entrance and the needed privacy. This object may be the best solution for those who demand the maximum from their lodging. From the house, you have direct access by feet to the beach 'n sea. Lain in absolute tranquillity and at just 450 meters from the heavenly beach of Mari de is Ominis. 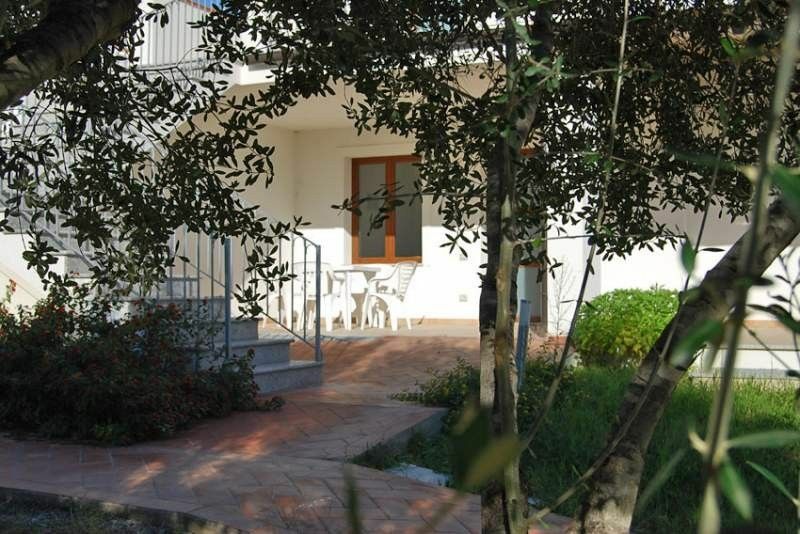 We're located at 'bout 4 km from the center of Bari Sardo, a town on the eastern coast of Sardinia. The Torre di Bari is surrounded by beaches an easily accessible by a short walk. The beaches of Torre di Bari are several kilometers long and tens of meters wide, these're divided into two parts by a small promontory on which stands the Spanish tower and from which it takes its name from the village. The beach to the left of the tower is called 'Mari de is Ominis', consisting of course sand-colored and surrounded by a pleasant pine forest. The beach on the right is called 'Mari de is Feminas' made of small gray pebbles and fine sand, crystal clear waters which extend down to the beach of 'Sa Marina'. Sport & Services on the beachside: Bars, Market, Restaurants, Baby parking (two hours morning and afternoon. Five a side football, Tennis, Kitesurfing, Windsurfing, Climbing on artificial walls. This large villa is an accommodation facility built on two levels and consists of five vacation apartments with separate entrances, well-appointed, comfortable and equipped with the maximum comfort. Surrounded by a variate Mediterranean vegetation and lain a few hundred meters from the breathtaking crystal-clear waters of Marina di BariSardo. This sunny location allows an easy access to the town of Bari Sardo situated at ‘bout 4 km, where you can find services such as supermarkets, souvenir and craft shops, restaurants, newsagent, post office and banks. With verandas and terraces. From the house, you have a straight access by feet to the beaches 'n sea. Lain in absolute tranquillity and at just 400 meters from the heavenly Beaches of Mari De Is Ominis. Surrounded by a private mediterranean garden property. The best way to discover the beauty and diversity of Ogliastra’s interior is on foot. Keen ramblers will not be disappointed by the island’s wide choice of hiking possibilities. What the mountains may lack in height, they make up for in the solitude that their untouched wilderness provides. There are few marked routes but many hiking outfits which offer guided excursions. Most of the guides speak English or German as well as Italian and are not just experts on the route and region but also on the island’s flora and fauna. One of the most beautiful hiking areas is without doubt along the Supramonte massif, which runs from Nuoro to Baunei on the east coast. Today, this area remains one of the most unpopulated and rugged areas in Europe. The narrow gorges, imposing chalk rocks, wide plateaus and hidden canyons run in an uninterrupted stretch of natural beauty. In Supramonte di Oliena you can explore the final retreat of the Stone Age Nuraghi people. Barisardo, Barì till Italy’s unification, originated from the joining of four ancient villages that sprung up around the rural churches of Sant’Antine, S. Leonardo, S. Cecilia and S. Susanna, identified still today with the villages four main neighbourhoods. Snuggled between the hills of Su pranu, Pitzu e Monte and the plateau of Teccu, Barisardo presents a favourable climatic situation and a countryside characterised by century old olive and almond trees and Mediterranean bush. Several domus de janas and many nuraghi, some of them in good condition are among the monuments to see in the surroundings. The 10-km-long littoral begins in the area called Cea and continues at Teccu with a series of basalt rock promontories, result of the eruption of an ancient volcano whose mouth is on the plateau itself. The coast, whose splendid reefs are the joy of deep-water divers, opens onto long strips of sand held together by the small rock on which the tower of Barisardo stands (Turri). Shady pine groves, wide patches of Mediterranean bush and rows of eucalyptus, with a wealth of typical local fauna and flora, outline the beaches up to the wetlands of Bau Eni and Tramalitzia, bordering with Cardedu’s territory. Inside the village, the parish church, built between 1600 and 1700, is well worth a visit for its precious stairway with balustrade of finely inlaid polychrome marble and its baroque steeple that dominates the whole village. To the left of the church, is the interesting oratory of the Rosario Confraternity, which dates back to the 17th century and now in need of renovation. Tortolì, the most populated village in Ogliastra stands near Arbatax, the sea entrance to the whole region. The port and the third category airport allow for direct connection with the mainland. The mainly flat territory is situated in a vast plain facing the sea.. Tortolì is one of the most renowned villages on the eastern coast, rich in citrus groves, characterised by the unique beauty of its coasts with plenty of peculiar reefs of red porphyry and white beaches, such as Lido di Orrì and Porto Frailis which definitely stand out for the whiteness of their sand and the limpidity of their waters. Several tourist resorts, hotels and camping sites located in some of the most beautiful coves on the coast, can welcome a great number of tourists. Tortolì – Arbatax offer many essential services for the perfect holiday. The construction of the tourist port in Arbatax, thanks to its services, has widened the range of offers available to tourists and made it an important stopover for pleasure-trippers who cruise along the eastern coast. In the territory of Tortolì there are also quite a few archaeological areas of great interest. The major ones are near the country churches of S. Salvatore, a temple surrounded by menhirs, domus de janas, giants’ tombs and nuraghi, and S.Lussorio, which is next to the ruins of a village dating back to the Roman era. Arbatax: This is the best well known town of the Ogliastra area, thanks partly to the presence of the commercial and tourist port and thanks also to its rather intriguing name: it derives from an Arabic word meaning 'fourteenth tower', for the Saracen tower which overlooks the seafront. Arbatax was born as a village of fishermen, many of whom came from the nearby island of Ponza, and it is from fishing that it earned its biggest fortunes, thanks to the significant variety of fish and crustaceans in the area. Arbatax is placed on the headland of Bellavista, and is surrounded by a natural scenery of bays and inlets which make it completely unique and fascinating. Starting from the Rocce Rosse (Red Rocks), famous throughout the world for their particular colour of porphyry, then the splendid Cala Moresca, on the eastern side of the town, and continuing towards the Telis, the Bay of Portofrailis and San Gemiliano - now residential areas built up using some interesting architecture - it is possible to admire different colours and landscapes, all both striking and enchanting. Final cleaning fee of €50. Included the energy and all bath, kitchen and bed linen. Payment Terms: Within 7 days after receiving our confirmation on your booking request you've to pay 25% of the total rent deposit. On arrival at your vacation home, the balance due has to be paid to the owner. Cancellation: Cancellation 9 months to one week time, before arriving, 50% of the total rent payable. If canceled less than the above term is 75% of the total rent payable. Regarding a withdrawal of your booking in case of serious illness, we can make an agreement that only 25% of the total amount will be paid from your side. Although when demonstrable with an authentic and signed medical certificate (no copies), which can be sent to our accountant for further verification. Die Wohnung ist ganz nett. Die Wohnung ist ganz nett. Leider auch etwas hellhörig wenn in der Wohnung darüber die Stühle und Tische gerückt werden. Wir haben für zwei Wochen beide Wohnungen von Gianni gemietet. Der Kontakt war schon vor der Ankuft sehr freundlich und wir sind sehr gut empfangen worden. Die Wohnungen sind genau wie beschrieben, sauber und die Ausstattung ist ok. Die Betten sind super bequem und der Strand ist in 5 Minuten erreichbar und selbst in der Hauptsaison nicht überfüllt. Wir kommen auf jeden Fall wieder! We booked both apartements for our vacation a few month ago. The contact with gianni was very polite and friendly and wie felt welcome from the First Moment. Both apartements are competely as they are described, very clean and the beds are comfortable. It ist just a short walk to the Beach and even in the main saison not too full. We like to come back again. Dear Maren, on behalf of Simone our heartfelt thanks for your review. A beautiful place to be !! Simone's villa situation is excellent, the view accross the street is gorgeous. The apartment is clean and nice, and Simone is a great host. Torre di Bari is really a beautiful place where to spend your vacation !! We're aware we'll come back !! J.de Feijter, Utrecht, Netherlands. La location était vraiment super en bord de mer et facile d'accès pour visiter le est de la Sardaigne, les propriétaires étaient vraiment super sympathiques et accueillants nous les remercions pour tout et du prix qu'ils nous ont fait pour la semaine, nous recommandons cette location !! merci à vous !! Valerie et Peter. The coastline of Marina di Barisardo with its beautiful sea bed, has long sandy beaches and in the middle are the rocks on which the Torre of Barisardo is built. The seaside of Marina di Barisardo which extends for more than 10 km, starts at Cea and continues with the area known as Teccu, formed of basalt outcrops formed by the eruptions of an ancient volcano. Golf: This large villa is an accommodation facility built on two levels and consists of five vacation apartments with separate entrances, well-appointed, comfortable and equipped with the maximum comfort. Surrounded by a variate Mediterranean vegetation and lain a few hundred meters from the breathtaking crystal-clear waters of Marina di BariSardo. This sunny location allows an easy access to the town of Bari Sardo situated at ‘bout 4 km, where you can find services such as supermarkets, souvenir and craft shops, restaurants, newsagent, post office and banks. With verandas and terraces. From the house, you have a straight access by feet to the beaches 'n sea. Lain in absolute tranquillity and at just 400 meters from the heavenly Beaches of Mari De Is Ominis. Surrounded by a private mediterranean garden property. We're located at 'bout 4 km from the center of Bari Sardo, a town on the eastern coast of Sardinia. Today, this area remains one of the most unpopulated and rugged areas in Europe. The narrow gorges, imposing chalk rocks, wide plateaus and hidden canyons run in an uninterrupted stretch of natural beauty. In Supramonte di Oliena you can explore the final retreat of the Stone Age Nuraghi people, who fled to a secret cave in Monte Tiscali. A sandy seabed with limpid waters and a coast where dazzling coves suddenly appear to break the long white stretches of sand and reefs, pebbles and red porphyry sketch a gorgeous landscape, variegated, rugged and uncontaminated. Ski: •Services on the beach: The beach is equipped with a kiosk bar, deckchairs and beach umbrellas. Do not miss the opportunity to kitesurfing and windsurfing, for water sports lovers, fishing and diving (with cylinder recharge and scuba equipment rental) for people who want to discover the hidden beauties in the Ogliastra sea. The village is an excellent base for mini-cruises towards the beautiful beaches of Cala Goloritzè, Cala Sisine Calaluna, Grotte del Bue Marino, or hiking, biking and horse-riding excursions, thanks to a riding stable at about 100 m from the village. Moreover the Ultima Spiaggia staff offers trekking, caving and canyoning in the uncontaminated nature of Ogliastra. No so far, it is possible to reach Arbatax, where there is the Trenino Verde della Sardegna train station, for a suggestive crossing on the old narrow-gauge railway, along the southern part of the island. The train, which moves slow, enable passengers to see and know at best landscapes and vegetation.